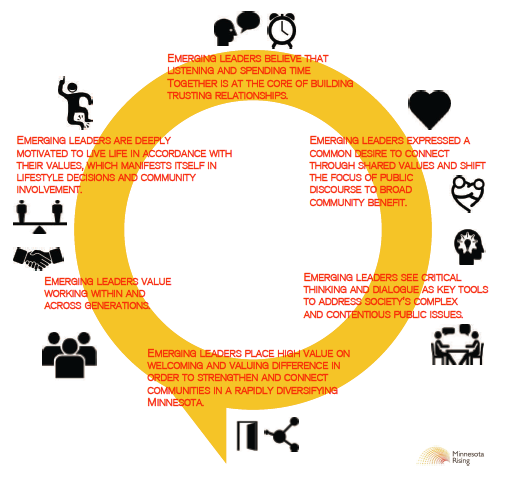 In honor of our sixth anniversary celebration, Minnesota Rising is excited to release the initial six findings from the “Our Minnesota” Cascading Conversations Tour! Watch the blog in the coming days to learn about how this group of emerging leaders views and does leadership in Minnesota. You can read more about the report methodology and participant profiles in the first post of this series. And as the name implies, we are looking to continue cascading these conversations across the state this summer – and invite you to join us. Let us know if you’d like to be invited to participate in a conversation and/or join our Advance Team and help host 3 to 5 conversations this summer!